This is a very small update, and it’s released mostly to fix a memory leak issue that existed in previous release. But it also has a new selfie feature. 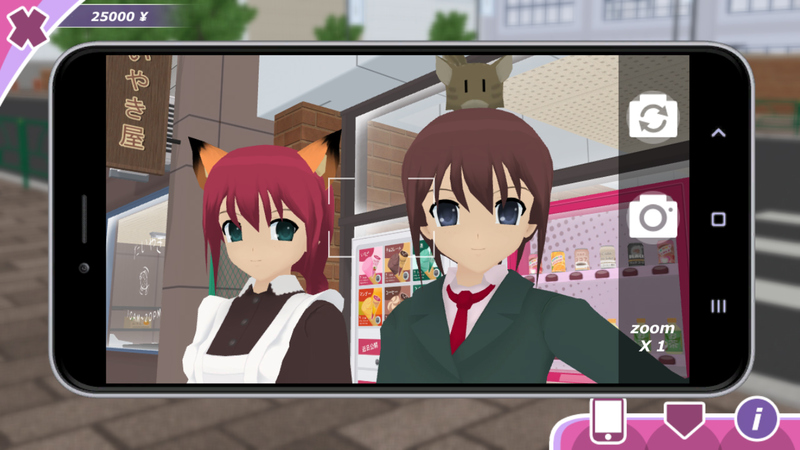 Now you can take selfies using in-game smartphone. After clicking on front camera button, your girlfriend will walk towards you for a photo (unless you stay too close to some obstacle). You can also take selfies with a pillow (in pillow dating mode) or with items in hands (e.g., ice-cream). Right now photos are not used for any purpose, but in the future it will be possible to print them to use as wall posters (or collect in albums). Taking photos with your girlfriend also will be used as one of dating activities in certain locations. Fixed a memory leak issue while using in-game smartphone. Fixed a bug that prevented closing girlfriend’s inventory in crawling mode. Fixed a few minor issues that happened if you managed to get arrested while swimming in the pool, eating in the cafe, playing piano, crawling (there were a few variables not cleared correctly). More accurate eye tracking of targets for all characters. will you bring steam updates to the non steam builds? Since i cant buy the game….. are you going to make the game free sometime soon? For people who cannot or don’t want to buy it, there is a free version. Maybe. The main problem with clicking on items on racks is that many people didn’t didn’t realize they could click on them (even after I added a poster explaining that), so all my work invested into making those Yandere Simulator figurines was kind of wasted. Maybe there should be some glowing/highlighting effects to indicate clickable items. I’m still experimenting with how to do it better. Can you make it possible to buy a dakimakara (not sure if I’m spelling it right) just to have it and hold it and stuff in “real girl” mode but not have it do much and the mode for pillow girlfriend is still there? I’m planning to make a separate shop in Akihabara, where you’ll be able to buy new pillows. But that will happen only when I have some progress with Akihabara map (at some point in 2019, I think).